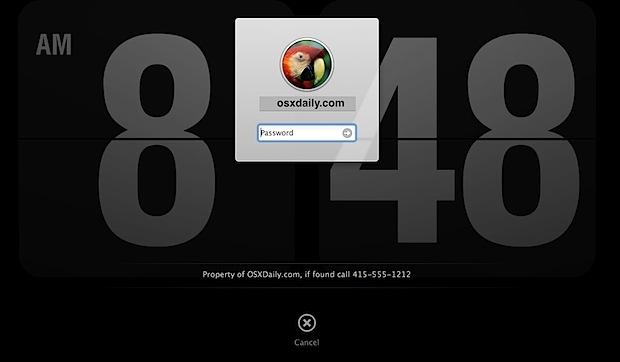 OS X has a nice new feature to login and lock screens that allow you to display a message underneath the login panel. This is visible to everyone who can see the Mac screen, and it makes for a great place to put either a bit of generic personalization message, or better yet, a lost & found message with some contact and ownership details. If you want to confirm the change, activate a screen saver with a sleep corner or lock down your Mac screen with a keystroke, just be sure that you require a password or you won’t see your message. Having a message on your lock screen is a great loss prevention and general anti-theft measure, since anyone who gets the Mac into their hands later will see the message and if they have a conscience, will hopefully call the number you set on the screen. This could also help if you ever accidentally misplaced a Mac laptop, and is a great addition to setting an “If Found” message as the iPhone lock screen wallpaper which was suggested by Apple a few years ago. This tip works universally on all new Macs with OS X 10.7 Lion, 10.8 Mountain Lion, and OS X Mavericks (10.9), and presumably all future versions of OS X as well. For those wondering, the screenshot background is actually the Fliqlo flip-clock screen saver, which will show itself behind the login and message that is placed. I like this one a lot. I learn something new every day here, thanks. If they have a conscious what? What is it and why does it need to be awake? Well I guess consciousness is required to have a conscience, right? Thanks for pointing out the typo! I work for a school and I miss the ability to ask users to click on the login screen for there ip address. Is there a way to add this function back to the login screen? How did you get the time in the back, thanks? How did you get the Flip Clock? Just wondering how you changed your login window background, I know it’s fliqlo but does it update? Or is it just a static image? It updates and runs like a normal screen saver, that’s actually the lock screen though and not the login window. But you raise a good question, so we will look into the ability to set a screen saver as the login window background, that would be a cool trick. NB: CLi must all be on one line!